Très chic sightseeing, singing and fashion in Paris! Alice-Miranda and her friends are in Paris with a group of teachers from Winchesterfield-Downsfordvale and the Fayle School for Boys. The students have a very exciting opportunity: to sing at Paris Fashion Week. The amazing city is humming with excitement and outrageous fashion choices – quite often coming from Mr Lipp, the children’s choir conductor. 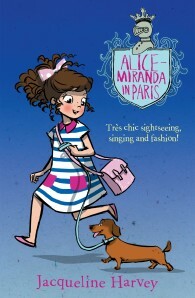 But a couple of France’s best known designers are harbouring serious secrets, and when Christian Fontaine has some expensive fabric stolen just days before his show, Alice-Miranda and her friends realise there is a darker side to the glitz and glamour of the famous city.